Plenty of hunters dream of joining a hunting company’s pro staff with the belief that they’ll get to hunt for a living, be paid big bucks and receive a closet full of free gear. For a handful of people who’ve reached celebrity status, this dream has become reality. For the majority of pro-staffers, though, the perks are much more modest. In reality, few pro-staffers are paid money for their services. Instead, they receive a limited amount of free or discounted gear in exchange for their work. And, most pro-staffers do not get to hunt for a living. Like you, they have normal jobs and only hunt during their time off, and usually, on their own dime. Lee originally had no intention of hosting a TV show or getting on a pro staff. 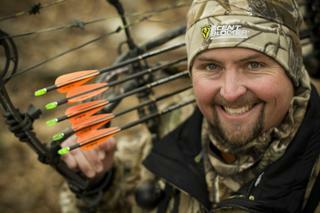 “I simply loved to hunt and wanted to be involved in the outdoor industry any way I could. I worked in an archery shop for eight years. I volunteered to run booths at trade shows. I also started writing articles for various hunting magazines. Even though I wasn’t getting free product, I always wrote about the gear I used because I believed in it. Companies appreciated that and took notice. Will being a pro-staffer land you free hunting trips? Not likely. What it will certainly do is create work out of your hunting passion. That could be a good or bad thing depending on your goals, but if one of those goals is simply more hunting time, joining a pro staff is not the best way to make that happen. “Companies are looking for people who will give back to the business,” Turner says. “The first step you need to take toward making it on a pro staff is to volunteer. Volunteer at your local archery shop. Volunteer at your state’s department of conservation youth events. Volunteer to man a trade show booth for the company you’d like to represent. Realtree’s pro staff compensation, which takes the form of money, free gear and/or a monetary allowance for free gear, varies depending on the level of pro-staffer. Although there are hundreds of solicitations each year, few people are added to the Realtree Pro Staff as a result of simply submitting a resume. Instead, most members of the Realtree Pro Staff have already been in the outdoor industry for some time, and have built relationships with Realtree employees in the process. They’ve proven that they are professional, well-spoken, and willing to work and represent the brand through their available communication channels. And they have a passion and knowledge of hunting and the outdoors. That, in a nutshell, is what’s required of any pro-staffer, anywhere. If it describes you, start following the advice these experts have offered, and be persistent. To be considered for Duckr’s Pro-Staff program and receive 80% off along with free Pro-Staff only gear contact us.